While attending college in the 60’s I was taught that the U.S. was a “Democratic Republic”. My Father would rebuttal by saying, “no, we are a Republic. Thinking my professors, and text books knew more than my Dad, I dismissed his words. But in more recent times, I notice students are being taught that the U.S. is a Democracy…leaving out Republic all together. My curiosity began to get the best of me, and I discovered that in the 60’s (and even earlier) the U.S. educational system began rewriting history: my father was right! Defined: A government by the people; a government in which the power is lodged in the hands of the majority. Athens, Greece had a Democracy. Judge Napolitano , a Constitutional Attorney, points out that, in a Democracy, the majority can vote to take your property, and your freedom if they so desire. History shows that Democracies result in agitation, discontent and eventually anarchy. As a result, this form of government has always ended in a collapse. If one reads the Constitution they will discover the word democracy never appears, but the word Republic does. Have you ever noticed we “pledge allegiance to the Republic”? We have done a disservice to the Egyptians now demonstrating in their Country for freedom by telling them we are a Democracy. If they had been told the truth, they might now be putting the emphasis on the creation of a Constitution (which would limit the powers of their government), rather than demonstrating for higher wages. Could this also be part of the story of what is happening now in the U.S.? Defined: The sovereign power is vested in representatives elected by the people. Authority is derived through elections by the people who elect those they think best suited to represent them. Justice Joseph Story: “This Constitution is truly republican, and forms a splendid era in the history of man. We do ourselves, our children and one another a disservice if we do not point out that the U.S. is not a democracy, and never has been. The book, A Familiar Exposition of the Constitution of the United States: Containing a Brief Commentary on Every Clause, Explaining the True Nature, Reasons, and … Designed for the Use of School Libraries and … Is an excellent resource for teaching, and learning about our true history, and the U.S. Constitution. As you can see, in a Republic, Egyptians would not be in a position in which they find themselves protesting a government for higher wages. Instead, they would first protest for a Constitutionally limited government…a government that would not have that power over them in the first place. In a Republic, teachers would not be working for the government, but for a free enterprise run by the parents of the children they teach . Thanks goes to both of these gentlemen for improving this post. 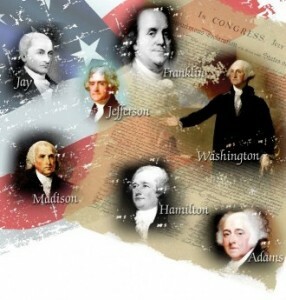 This entry was posted in Lesson Plans, The U.S. Constitution and tagged republic, u.s. constitution. Bookmark the permalink.